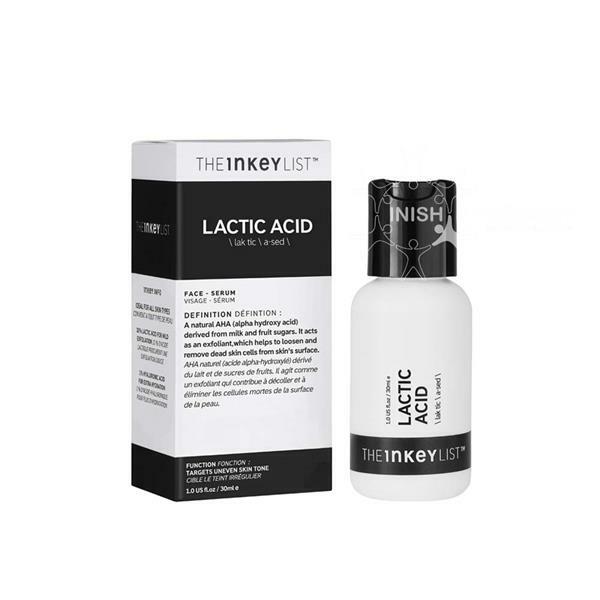 The Inkey List - Lactic Acid serum contains 10% lactic acid AHA naturally derived from milk and fruit sugars. This gentle exfoliating serum which contains the mildest of the AHAs, works to loosen and remove dead skin cells from the surface by dissolving the bonds binding dead skin cells to your complexion surface, gently loosening and removing them to reveal brighter, smoother skin underneath. Lactic Acid also boosts moisturising properties to keep skin soft and smooth. Also contains hyaluronic acid to penetrate the lower skin layers for deeper hydration at the cellular level. Use in the PM. Apply one to two drops to the fingers and gently pat into cleansed skin. Follow with other serums and moisturisers. Start with one application every other night and increase to once daily if desired. Lactic Acid is an AHA and can increase sun sensitivity due to its exfoliating properties. We recommend prior to sun exposure, covering areas where the product has been applied with sunscreen and for 7 days after use. Avoid direct contact with eyes and lips. If irritation occurs discontinue use and consult a doctor. You may feel a slight tingling or hot sensation on the skin when applying, however, if there is any itching or a prolonged burning sensation discontinue use immediately. Lactic Acid is an AHA (Alpha Hydroxy Acid). AHA's are a gentle and effective way to exfoliate the skin, you just need to ensure you're choosing the one that's right for you and not overdoing it. Lactic Acid is the gentlest of all of the AHA's. If you're new to AHA's or have sensitive or dryer skin, this product is a good place to start. We advise starting with every other night to begin with. Using with a Retinol - if you are also using a retinol product in your PM routine, and want to add an acid we suggest using acids weekly or if you want to use your acid more regularly, alternating with Retinol. If you do wish to use both on the same day, due to PH levels we would recommend waiting around 20 minutes before applying your retinol and be careful of overuse as both increase skin renewal and may cause sensitivity.